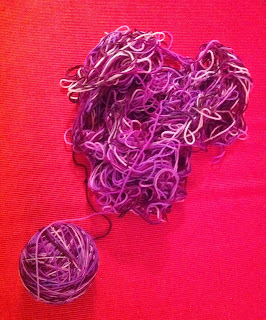 Yes, that's right - after a ridiculous number of hours last night and today spent untangling the painted purple skein of sock yarn that I USED TO love, I have finally managed to conquer its knottiness. 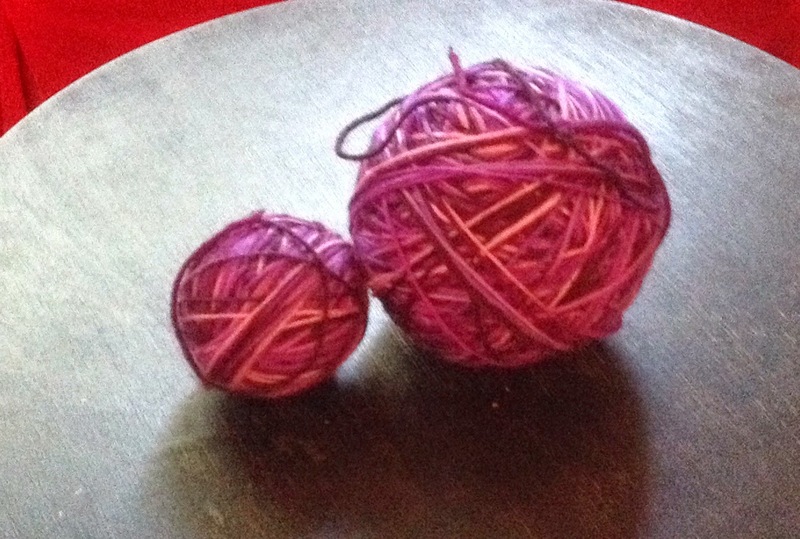 There are 2 balls there because the yarn was split in one place, which probably contributed to my winding problems in the first place. No, this isn't turning into a knitting blog. I just needed to vent. Also, this is what passes for excitement around here. In fact, it's been so exciting, I forgot to mention that I finally met Juggling Jenn in person a couple of weeks ago. She was in DC to advocate for better treatment for eating disorders, yet she made time in her busy schedule to get together with me for dinner. I met her at her hotel and we walked a few blocks to see the White House, something I hadn't done in, oh, about 2 decades. That's the problem with living near our nation's capital - you take it for granted, and a visiting tourist ends up having to show you around. We spent a few hours talking about everything and anything - blogging, eating disorders (of course), kids, mental health care. Jenn was exactly as she appears to be in her blog, which was a relief. We've read each other's posts for just about forever (in blog years), so it felt like catching up with an old friend. Gosh, I love blogging. Too bad it's dead. Soon it will only be old ladies like me left on Blogspot and Wordpress and Typepad. 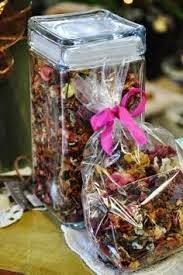 Everyone else will be all witty on Twitter and annoyingly cloying on Facebook (What a great day! I have the best hubby! ), and I will still be here reminiscing about kids and vomit and mice. 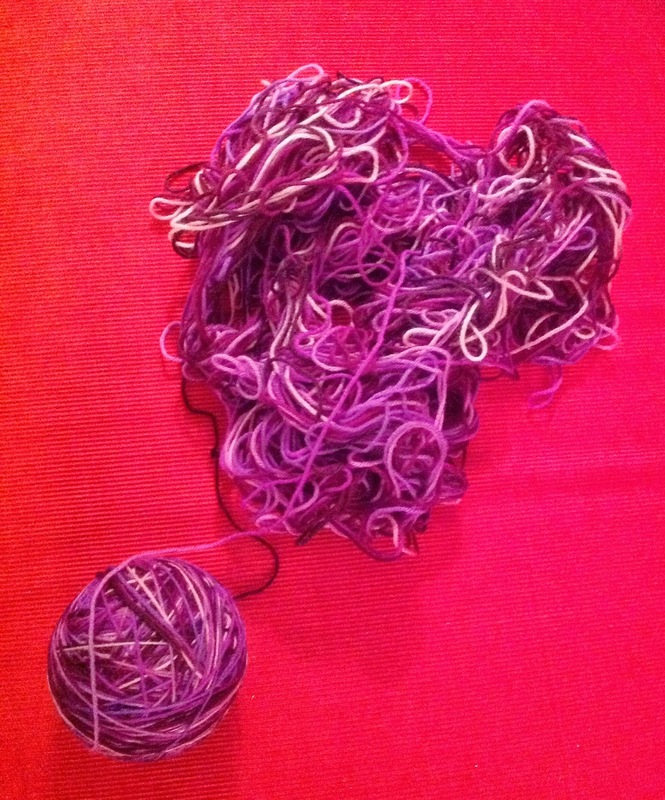 I have spent my entire evening trying to untangle the above skein and roll it into a ball. Hours that I could have spent knitting if this skein had only behaved as it was supposed to, but no! I still have a ways to go, and no finished (or even started) fingerless mitts in sight. 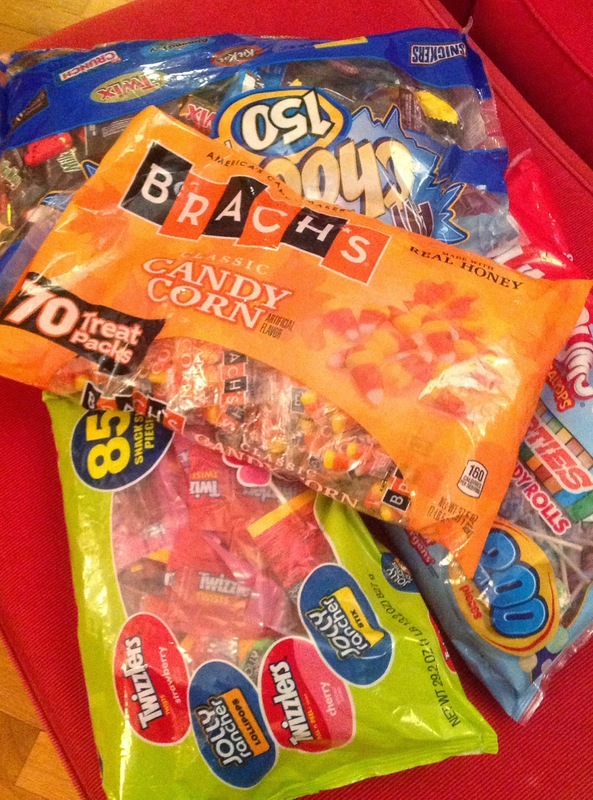 Meanwhile, there are SO MANY BAGS of Halloween candy in this house, and every one of them is calling my name. Particularly the one that has those short, fat, chewy Twizzlers in it - you know, the kind you can only get around Halloween? I love those so much. I probably should check to make sure it's the right kind, no? I'd hate to be disappointed on Friday, and if I test them now, I would still have time to go out and search for the right ones. Of course, if I do that, it will be a candy free-for-all around here for the next 5 days. ALL BAGS MUST STAY SEALED. Get thee behind me, Twizzlers! We have so many festivities planned, this holiday is getting busier than Christmas. Pumpkin carving on All Hallows Eve Eve, as it were, and then a trip to Chipotle in costume on the High Holy Day itself, in order to buy our $3 Booritos, and then of course trick-or-treating, followed by the Great Candy Swap in our living room. Auntie Kate is arriving just in time for all the excitement. She used to arrive the week before Halloween, but she's wised up - she always ended up making all the costumes that way. So that's what is on my mind tonight - candy and yarn. And candy. Does anything else really matter? Then this evening I went out to hear Anna speak (I know, again - I am becoming a stalker). I actually worked up the nerve to introduce myself this time. It was a small group and a great discussion. My only disappointment was that my copy of Rare Bird didn't arrive in time (Yoo-hoo, Amazon - what's up with the (not) 2-day delivery? ), so Anna couldn't autograph it. Looks like I will have to keep stalking her, I guess. Okay, usually I sit down and start typing and a topic sort of emerges, but tonight my Muse stays stubbornly silent. So I leave you with this informative video on the perils of second puberty (aka middle age). Enjoy! It's late, The menopause fairy won't let me sleep. I hate her. The only time I ever want/need to sleep is at 4:30 in the afternoon. I tried taking pictures of my creations, but they don't look right. I swear, I am the only person on earth at this point who lacks photography skills. Everyone else is using filters and doing whatever else it is that you do to make your photos look amazing, while I am still just trying to make sure to get whatever it is I am photographing into the frame. In other news, my fit friend adopted an older puppy. She brought the dog along on our walk today, which would have been FINE, except a neighbor of mine tripped over another neighbor's dog leash on Saturday and managed to bash her face in and break both her forearms. I know, awful. So I spent the entire walk convinced that the dog, which was essentially trotting in circles and attempting to wrap its leash around us the entire 3 miles, was going to be the death of me. I'm a lot of fun, really. Okay, that's what's new. I'm going to go pretend to sleep now. What are you folks up to, anyway? Friday? Already? Look, people, what the heck is going on here? One second it is Tuesday, and I am boasting about canning some applesauce; and next thing I know, it is 3 DAYS LATER. Has the space-time continuum been collapsing inward, or what? At this rate, I'll be 80 years old by Wednesday, I swear. We have some pumpkins now. You know what a good friend is? 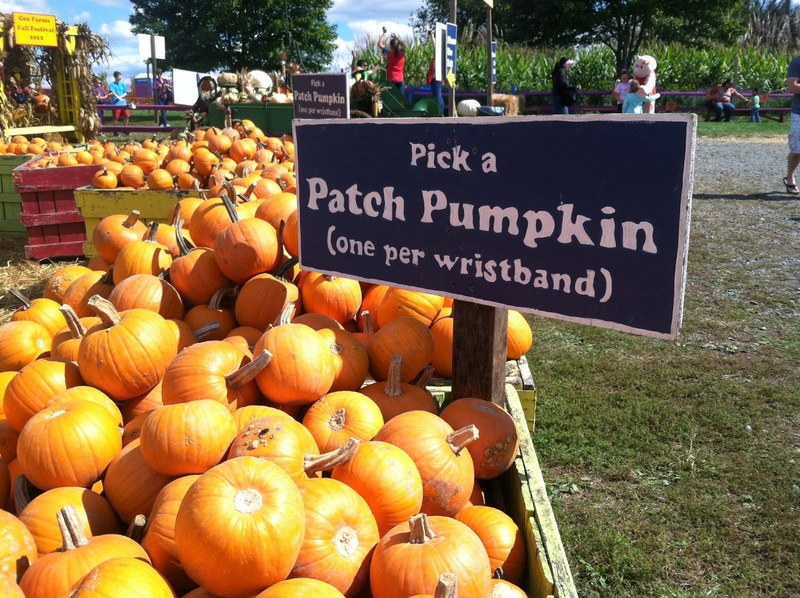 A good friend is someone who volunteers to take your 2 girls to the local fall farm festival for 4 hours when she notices that you are on the verge of a nervous breakdown because you need to accomplish 3 billion small and discrete tasks before heading off on a trip the next day. I'm thinking I sounded a little frightening on the phone, babbling about snowplow contracts and hair appointments and Party City, all in one breath. But I feel better now. New haircut, snowplow contract signed and mailed, and heck, our hotel in NJ is right next to a Target - I can find party tablecloths and plates there. Breathe. Just breathe. Of course, I am looking at 4 1/2 hours in the car tomorrow with 4 kids, one of whom has been down with a stomach bug all day today. He definitely gets a window seat, I'm thinking. Time for some shut-eye, as Larry keeps threatening to wake me at some ungodly hour in order to hit the road early. I've packed my knitting and our Harry Potter audiobook, so I'm ready, right? We are heading up this weekend for the unveiling of my father's tombstone (it's a Jewish thing), followed by some awesome deli food and then another 4 1/2 hour drive home. Sort of like speed dating, only more stressful. Enjoy your weekends! Relax for me, will you? So today has been all soda and pretzels (no beer) and hunkering down with school work and making yet ANOTHER crockpot full of applesauce, which batch might just make it into the canner before we eat it all. Or not. 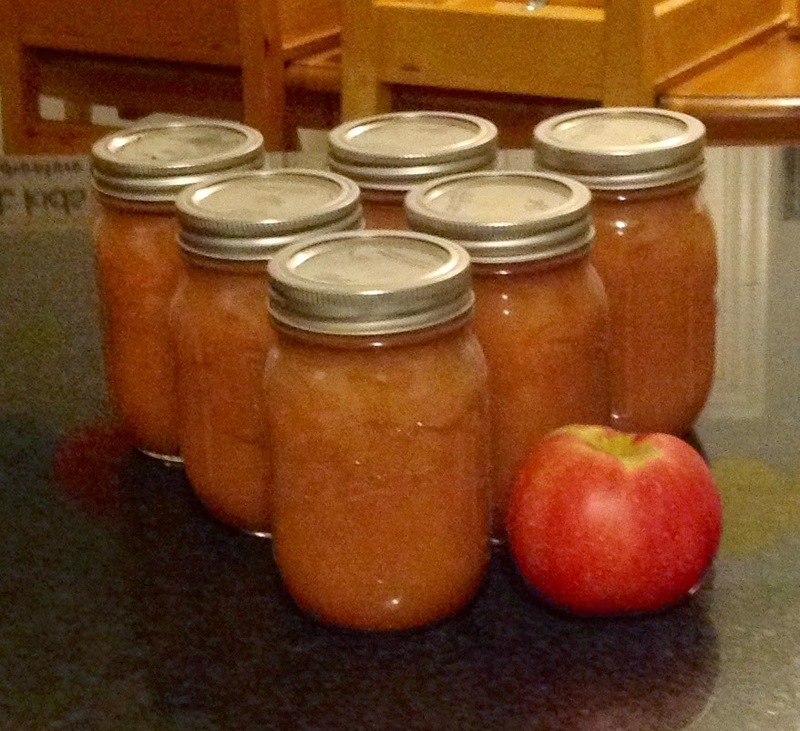 I haven't been able to get around to canning applesauce the past 10 years; I don't see why this fall should be any different. 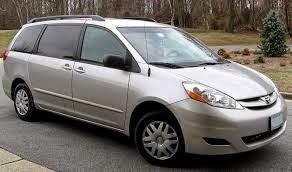 Larry declared today FIX ALL THE CARS Day and has been shuttling our fleet of minivans over to the nearby garage to have oil changed and whatever the heck else they do that ends up costing us close to a thousand bucks a year. 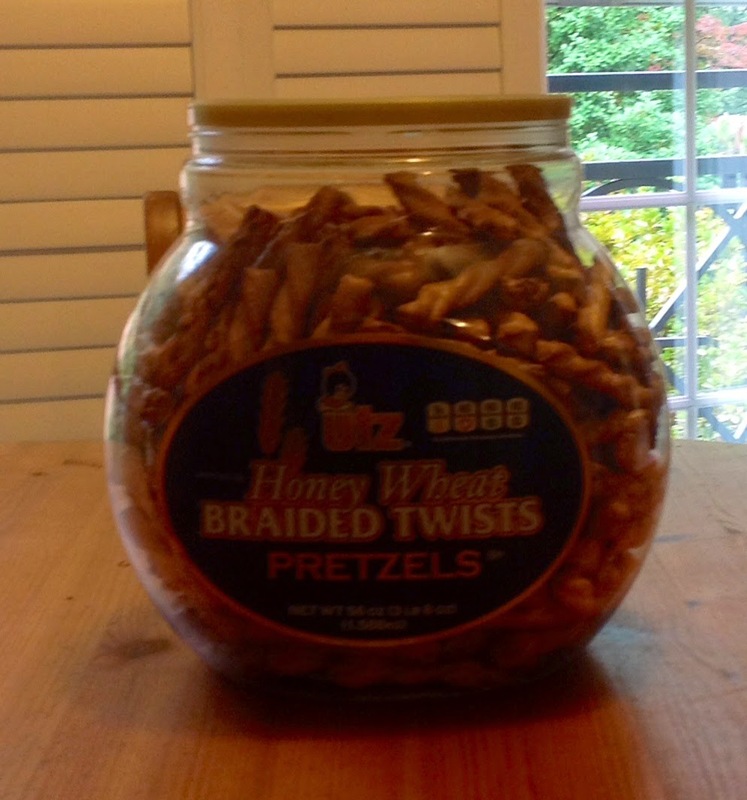 We like to support the local economy, so it all works out. You're all jealous of my mad photography skills, I can tell. 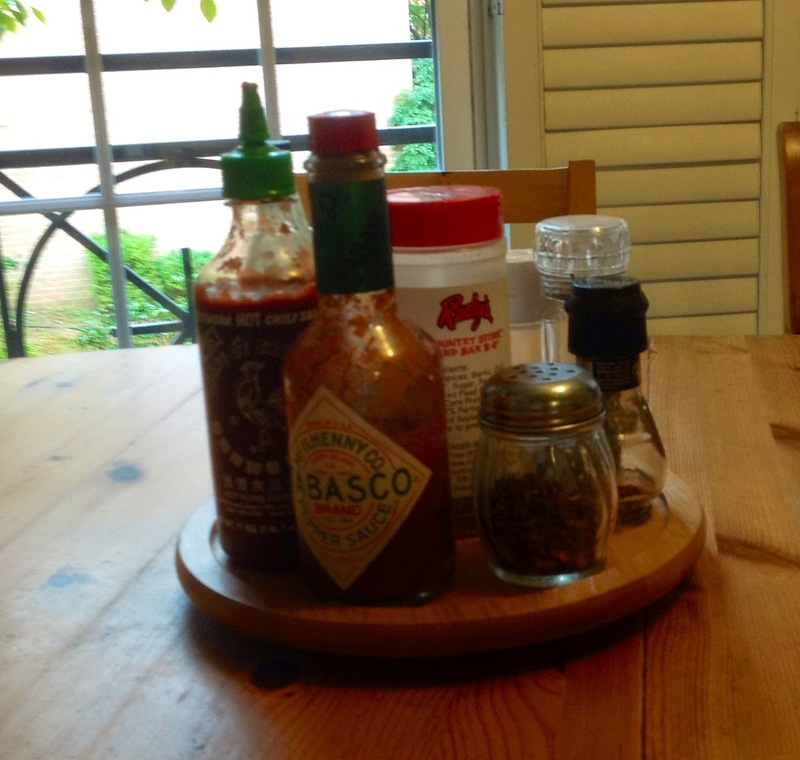 No, I am not talking about the warehouse-size bottle of tabasco sauce; look at the lazy susan underneath it. LOOK AT IT! No more having to ask people to pass the salt or otherwise communicate in a civil manner at the dinner table. Now we can just spin that thing like a big ol' roulette wheel and hope that it lands with the Sriracha sauce facing the right person. Vingt-et-deux, ladies and gentlemen! Vingt-et-deux! Just popping in to let people know I am still alive, just life is kicking my a**. It's a non-stop game of Whack-a-Mole, and I don't foresee its stopping any time in the near future. Maybe when Brian goes away to college in 3 years or so? One can hope. This looks like fun, but it isn't. Not at all. We're in the middle of David's college and National Merit Finalist applications, with all the concomitant requirements and deadlines. This is stressful, very stressful. Brian is quickly turning into a disenchanted teen, and the loss of his cheerful countenance pains me so. Rachel is engaging and cooperative and cheerful, but all I can think is "I've got one more year, max, before this changes." And Susie, praise be to God, has truly caught on to reading and has been holed up for the past 2 weeks or so in her freshly painted room with the Harry Potter series. A side note here: scientists did a study where they took identical twin babies and let one (the control, as it were) figure out how to crawl up a flight of stairs on its own while they trained the other one intensively on how to do the same thing. Both babies learned the skill at the exact same time anyway. Why am I sharing this with you? Well, my oldest (Theo) was the only other really late reader in our family; I pretty much let him be until I saw him picking up books and trying to puzzle them out, at which point I did some intensive phonics with him for maybe 4 or 6 weeks. He learned to read at the age of 9 years and 3 months. But for all these years, I've wondered whether or not I should have been pushing him sooner, doing more phonics, etc. Maybe I had done him a disservice by being so laid back about the whole reading thing. So along comes Susie (aka Guinea Pig #6), who also seemed to have no desire to read on her own. Oh, I worked on that child, people. I tortured her with phonics lessons for 2 straight years, but guess when she finally took off with the reading. Anyone? That's right - 9 years and 3 months. Where was I? 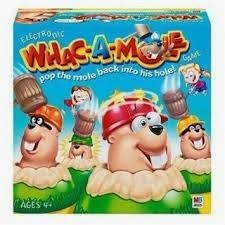 Oh, yes, Whack-a-Mole - despite the craziness that is my life right now, I decided that I have lost the habit of reading real books and magazine articles that are longer than a page. I set a new goal for myself of reading my New Yorker cover to cover (instead of just glancing at the cartoons and then misplacing it) and also reading an entire book each week. I know! So 20th century of me, right? I started with The Handmaid's Tale (by Margaret Atwood). I knew the book was some sort of dystopian story, but people - I was so depressed at the end of it, I could barely convince myself to get out of bed the next day. 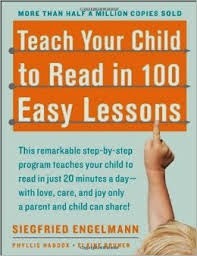 I'm unloading it on PaperbackSwap if anyone is interested (friend me - I'm suburbanmama), just to get it out of the house. I decided to follow that up with something inspirational and tried The Boy Who Harnessed the Wind. It was an excellent antidote, and it also made me realize that, if David had been born in Malawi? He would have been the one supplying his entire village with power by building a windmill out of scraps from the town junkyard. It almost made me feel guilty for not letting my resident tinkerer junk up his room more - who knows what he would have invented by now? I have more to share (I met another blogging friend in person - I'm on a roll! ), but it will have to wait until tomorrow. I've got to go pick up my mallet again; these moles are getting out of control.